So, I'm back in Boston after a wonderful few weeks with my adorable puppy. I miss him so much! It was so great to see him, and to see that he hadn't forgotten me. I miss waking up and having him so excited to see me when I open the door to let him out. Or, if someone else is home and has already let him out, seeing him wait for me at the gate tio the hallway or hearing him cry if I'm taking too long to wake up. But, like I said, I'm back in Boston now and I'll be here for a while again. Still on my hunt for Shibas, but when I don't see them, I'm also still planning on doing my MSPCA shout-outs. I was so happy to go onto the MSPCA this morning and to see that some of my favorites (AKA: Spot and Sandy) aren't there anymore. They've finally found themselves good homes. Here's hoping that more little guys from the shelter get good homes! Here's the adorable Rufio! I'm pretty sure he's new. He's only 4 months old, so I hope he'll find himself a good home soon. He's just so cute that I couldn't resist taking a picture of him. He's playful and curious. Even though he was sleeping when I came in, as soon as I opened the door he bounded over and did everything in his power to escape. He's a bundle of energy and a bit of a handful, but he's also a sweet little guy who would make a great playmate. Rufio's gone! Yay! 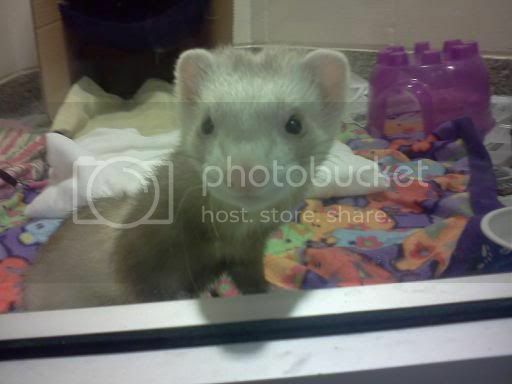 He's either at the ferret rescue with the others, or he found himself a forever home.